In vino veritas — in wine there is truth — this is one of the touchstones of the wine enthusiast world. I like the sound of this, but I admit to being a bit confused by two recent wine tastings that I organized where the wines easily fooled us (or perhaps we just fooled ourselves), but a third tasting helped put things right. Mary Thomas asked if I would be willing to speak at a wine tasting that she donated (along with autographed copies of Wine Wars) to the local YWCA fund-raising auction. Yes, of course — and I knew at once what I wanted to do. A flight of red wines made by three University of Puget Sound alumni (Tom Hedges of Hedges Family Estate, Chuck Reininger of Helix and Reininger Cellars and Michael Corliss of Corliss Estates and Tranche Cellars), but first a blind tasting of white wines that figure prominently in Wine Wars. If you’ve read Wine Wars you know that I end each flight of chapters with a wine tasting designed to explore the themes raised in the book. 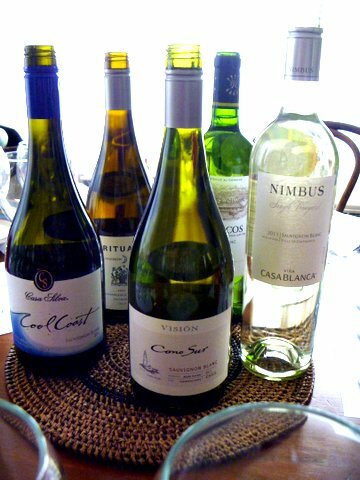 Three Sauvignon Blancs make up the first flight and thus inspired I put together a tasting of Charles Shaw (a.k.a. Two Buck Chuck) Sauvignon Blanc from California, Robert Mondavi Fume Blanc from Napa Valley and Cloudy Bay Marlborough Sauvignon Blanc from New Zealand. After tasting the three wines blind in the order given above I asked the tasters to (1) name the grape variety, (2) guess the country or region of origin for each wines, (3) guess the prices and (4) choose their favorite wine from among the three. 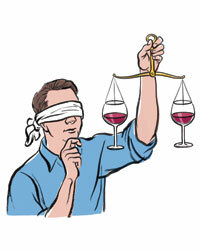 I am not a big fan of blind tastings, but this one is fun to do in a group. I thought the auction group would enjoy it (and they did). But first I decided to try out the blind tasting on my “lab rats” — the students enrolled in my university “Idea of Wine” course. Their tasting featured the same blind first flight followed by a different set of reds — a vertical of three Phelps Creek “Le Petit” Pinot Noirs from three years with very different weather. My hypothesis was that students would have more trouble guessing the grape, terroirs and prices of the blind flight than would the more experienced wine drinkers in the auction group. Things did not go according to plan. After tasting the three white wines the college students were very confused and guessed all the grape varieties they could think of, but not Sauvignon Blanc. For me the signature taste of the Cloudy Bay is a giveaway — Marlborough Sauvignon Blanc — but tasted in the context of the Fume Blanc and Two Buck Chuck wines, which are so very different, nothing seemed to make sense. The common thread that connected the three wines was difficult for these wine novices to detect. Interestingly, the experienced auction tasters did no better than the lab rat students in this regard. This really did surprise me and I think it was the confusing context that caused the trouble. Tasting the Mondavi Fume or the Cloudy Bay by itself might yield a good guess of type of wine or place of origin, but stringing the three wines together apparently distorted the view a bit too much. One place where there was a significant difference between the groups was when it came to guessing the prices. The experienced auction group did much worse! How is that possible? Well, the big difference was the Two Buck Chuck. No frugal college student would offer to pay more than $12 for it in the blind tasting, but at least one member of the auction group was willing to pay $25 or more! Why were seemingly rational people willing to pay so much for such a modest wine? Well, the quality of the Two Buck Chuck must be part of the answer. Wine drinkers of a certain age (and I include myself in this category) remember when cheap wines were really foul and Two Buck Chuck and its bargain priced siblings changed all that. The quality may not be high (only a couple of people in the two groups picked it as their favorite of the three), but it does reach a commercial standard that actually shocked one experienced drinker who had not previously tasted a $2.49 wine. But the real answer is again probably context. The students are used to me presenting them with wines that are just outside a student budget — wines that cost say $10 to $30. They guessed at the low end of that range, which made sense given their expectations. The auction group’s higher guess also reflected context. Who would expect to attend a charity auction tasting and be served such a simple inexpensive wine? Impossible! So it must cost a lot, the logic probably went, and I just can’t taste the difference! If true, this is a classic case of using price (or expected price) as a proxy for perceived quality. Which was the favorite wine? The auction group was pretty much divided between the Mondavi Fume and Cloudy Bay. The students were divided, too, but Cloudy Bay received most of the votes. That Marlborough style is so distinctive — like nothing they ever had before — and in a blind tasting context it stood out to them. What conclusion can we draw from these two tastings? Our perception of wine is sometimes less about truth and more about context and expectations than we might want to think. That’s not the conclusion I thought I would find when I set up this tiny experiment. Fortunately a third tasting helped balance the scale. The nice people at Wines of Chile sent us three Cabernet Sauvignons, which we decided to use for a small scale student tasting. Sue and I were joined by Bruce Titcomb, Eben Corliss and Ali Hoover. Ali’s attendance was based upon her study abroad experience in Chile and a paper she wrote about its wines. Bruce and Eben are enthusiastic students of geology and business respectively with a special personal connection — their parents also took classes from me back in the day. It promised to be an interesting tasting. We began with a glass of Sauvignon Blanc (from Chile this time) and then got to work on the Cabs we were sent. Here is the list. Montes Classic Series Cabernet Sauvignon 2011 Colchagua Valley 85% Cabernet + 15% Merlot 14% abv. Typical price: around $10. Santa Carolina Colchagua Estate Reserva Cabernet Sauvignon 2011 (from Miraflores in Andes Foothills) 13.5% abv. Around $12. Undurraga T. H. (Terroir Hunter) Alto Maipo Calbernet Sauvignon 2009 (from Picque in Andes Foothills) 14% abv. Around $20. We sampled the three Cabs by themselves, with food (savory empanadas) and then with chocolate truffles. The wines were very different from each other and each had its moment in the spotlight. On first tasting, the Montes (the least expensive of the group) was simple, enjoyable, and fun. When Ali tasted the Santa Carolina her eyes lit up — this was Chilean wine as she knew it from her time there, she said — a reminder of her temporary South American home. The Undurraga T.H. lived up to its “Terroir Hunter” name — it was much more precise and focused. Returning to the wines to pair then with food the Montes was a puzzle — Blake noted a strong caramel aroma when the wine had time to air out a bit. The Santa Carolina seemed to be the best match for the empanadas just as the T.H. was the favorite on its own. Then we broke out the dark chocolate truffles and tried again. This time it was the Montes that stood out — that caramel aroma really worked with the chocolate and made a hard to beat combination. Which wine was best? Well the T.H. was probably my personal favorite but the answer depended on how you drank it (alone, with savory food, with chocolate) and what you were searching for (for Ali that memory of her time in Chile was pretty special). So what did we learn from our three tastings. Well, I don’t really want to argue against the idea of in vino veritas, but I do think our impressions of wine are context-sensitive — perhaps more so than we really want to admit. Blake, Eben and Ali at the Chilean Cabernet tasting. Thanks to Emily Denton of The Thomas Collective for providing the Chilean wines for this tasting. Thanks to Blake, Eben and Ali for their help with the Chilean Cab tasting. Photos by contributing editor Sue Veseth. I always look forward to the week between the Christmas and New Year holidays because that’s when the pace seems to slow down a bit and I can settle in to read The Economist‘s special double issue. Of particular interest this year is the essay on page 123 called “Tyranny of Choice: You Choose.” The main point is simple, but the implications are quite broad, with particular relevance for today’s wine markets. The simple point? Choice is good, but only to a certain degree. Too much choice is, well, too much and can sometimes stop decision-making dead in its tracks. I say that this is a simple point because we have all suffered from the problem of too many options overloading our preference systems. Or am I the only one who sometimes has trouble ordering coffee at Starbucks or a sandwich at Subway? Government is a good example of this Paradox of Choice. One party rule is notoriously problematic. Multiple parties provide useful competition. But at some point more political choice is really less –particularly less in terms of stability. Fragile, shifting multi-party coalitions mean short governmental half-lives with no one looking after the whole since everyone’s focused on their own tiny slice of the electoral pie. What makes The Economist article interesting is that it ties together so many elements of this dilemma, from literature to academic research and from potato chips to human reproduction. Wheel a trolley down the aisle of any modern Western hypermarket, and the choice of all sorts is dazzling. 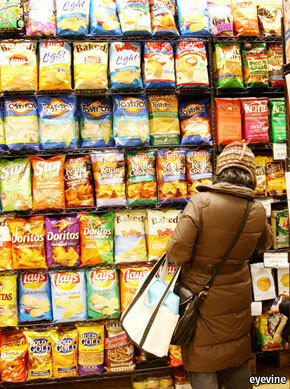 The average American supermarket now carries 48,750 items, according to the Food Marketing Institute, more than five times the number in 1975. Britain’s Tesco stocks 91 different shampoos, 93 varieties of toothpaste and 115 of household cleaner. Carrefour’s hypermarket in the Paris suburb of Montesson, a hangar-like place filled with everything from mountain bikes to foie gras, is so vast that staff circulate on rollerblades. One cost of this embarrassment of riches is confusion or, put another way, higher transactions costs. Making a choice means comparing the qualities and value of different options, which is difficult enough when there are only two brands of breakfast cereal, but mighty time-consuming and complicated when there are 200. The Economist explores several dimensions of this problem, citing a Nobel Prize winning economist (Daniel McFadden), an Italian novelist (Italo Calvino) and cartoon character Marge Simpson! Expectations have been inflated to such an extent that people think the perfect choice exists, argues Renata Salecl in her book “Choice”. … In one episode of “The Simpsons”, Marge takes Apu shopping in a new supermarket, Monstromart, whose cheery advertising slogan is “where shopping is a baffling ordeal”. “How is it”, muses Ms Salecl, “that in the developed world this increase in choice, through which we can supposedly customise our lives and make them perfect leads not to more satisfaction but rather to greater anxiety, and greater feelings of inadequacy and guilt?” A 2010 study by researchers at the University of Bristol found that 47% of respondents thought life was more confusing than it was ten years ago, and 42% reported lying awake at night trying to resolve problems. Greater choice first delights us, then overwhelms us, then it can sometimes drive us crazy. There must be a “best” among all the rest. Which is it? And how will I know? The quest for the best can sometimes destroy the pleasure of the very good by introducing an unwanted but unshakable sense of doubt. Which brings us to wine. It does seem like the problems of exaggerated choice apply especially to wine. Of those 48,000 items on the upscale supermarket shelves, chances are that 1500 or more are bottles of wine. Wine is the largest choice space in the modern grocery store, ten times richer in terms of the number of options than the #2 area (breakfast cereals) and much more complex. Wine buyers have never had it better in terms of the number of choices available from around the world. And we’ve never had it worse regarding the possibility of confusion and the pressure to find our perfect wine. It’s the Age of Anxiety for wine. The hottest wine sectors today are Marlborough Sauvignon Blanc and Argentinean Malbec; is it a coincidence that these wines are easy to understand, with many good producers at various price points? The problem of choice still exists for buyers of these wines, of course, but perhaps more of the pleasure of choosing survives. Stein’s Law, named for presidential economic advisor Herb Stein who coined it, holds that if something cannot go on forever it will eventually end. If that sounds like an obvious conclusion remember that, Freakonomics aside, most of what economists do is point out the obvious to people who somehow fail to see it. Think about everyone who was surprised that the housing bubble imploded and that credit crashed. Everyone knew that rising housing prices and expanding mortgage debt couldn’t go on forever, but many acted like it would never end. If only they had remembered Stein’s Law! I wonder if this is a Stein’s Law moment for the New Zealand wine industry? Objectively the New Zealand wine industry has all of the classic characteristics of a bubble (and I’m not talking about sparkling wine here). The industry has expanded at a break-neck pace in recent years, fueled by foreign investment. The home market is quite small, so increasing output has been pushed into export markets, especially Australia, the U.S. and Great Britain. New Zealand wines are best sellers in each of these markets. Incredibly, New Zealand has been able to continually expand export sales while maintaining its historically high export price. (No country has received a higher average price for its table wine exports in recent years.) The high prices, of course, draw in more investment, so production continues to grow and the cycle repeats. If I told you a story like this about a financial investment of some sort you’d probably tell me that it sounds like a Ponzi scheme — no way this can go on forever. Pretty soon the market will be saturated and prices will have to fall. This is what worried the New Zealand winemakers I talked with when I visited there a few years ago: the moment when exports at a premium price would become unsustainable. They worried that their fine wines would become commodities, sold in bulk at permanently lower price points. Any luxury good retailer will tell you that it is hard to push prices back up once buyers come to expect discounts. New Zealand Winegrowers’ annual report released yesterday shows exports surged 24 per cent to $992 million and the industry is on track to reach the $1 billion mark this year, a year ahead of expectations. This was largely driven by bulk exports, which Mr Smith said were a concern to the industry. Historically, bulk wine exports have accounted for less than 5 per cent of total export volume; in the past year this quadrupled to nearly 20 per cent as producers looked to shift excess inventories. Bulk exports might relieve pressure on wineries in the short term, but in the long term they could damage the market positioning and the reputation of New Zealand wine, Mr Smith warned. A surplus of Marlborough sauvignon blanc is driving down wine prices, says a Nelson wine producer. Brightwater Vineyards’ owner, Gary Neale, says his company is up against an oversupply of discounted Marlborough sauvignon blanc exports. Mr Neale sells his wine for 10.50 (NZ$25.80) in Britain, but British consumers are being offered three bottles of Marlborough sauvignon blanc for 10 , or 3.99 for one bottle. An email from his Sydney agent tells of New Zealand wine being sold at A$4 a bottle, and Marlborough sauvignon blanc is selling there for as little as A$2.75 when buying six bottles. “In the past, Australia has been a very easy and a profitable market, but Australia is absolutely flooded with cheap Marlborough sauvignon blanc,” says Mr Neale. With the Australian dollar trading at about 83 U.S. cents this morning, that makes makes the Marlborough six-pack price a little over $2.25 US per bottle — Two Buck Chuck (TBC) range. An article posted today on Decanter.com reports low prices in the U.K. market, too, although not so low as in Australia, and sounds an optimistic note. The sale of £3.99 Marlborough Sauvignon Blanc is a short-term ‘blip’, according to the European head of New Zealand Winegrowers. Following the record 2008 and 2009 vintages, increased production created an oversupply problem, giving rise to the first-ever £3.99 New Zealand wines as producers tried to clear tank space. £3.99 translates to about $6.50 US — well clear of the TBC price, but frighteningly low for New Zealand wines in the UK market. Let’s put this price in context. New Zealand producers received an average price of $6.00 for their exports in 2001-2005. Retail prices in the export markets were necessarily much higher to reflect transportation and distribution costs, tariffs and retail mark-ups. No wonder so many Marlborough Sauvignon Blancs have been priced in the $15-$20 range in the past. If NZ wines are retailing for the equivalent of $6.50 in London then, working backwards, this suggests that net producer prices have plunged to less than $3, at least for the bulk wine product. That’s a huge drop and it is hard to see how production is sustainable at this price point. So is this it? Has the bubble burst? Is the future of New Zealand wine all black? No. The reputation of New Zealand wine is very strong and it may well be that consumers will be able to differentiate the bulk product at bulk price from the premium product higher up on the shelf as they do for products from France and California. The danger is that the whole national brand is devalued. That would be a devastating blow. It would be a mistake to over-react to this news, but it would also be a mistake not to react at all. Stein’s Law holds here as it does in so many cases and the surpluses will go away one way or another — either because the growers act to control them or else because the market collapses and they get sold off at bulk wine prices. Decanter.com reports that Nobilo Marlborough Sauvignon Blanc has overtaken Kendall Jackson as the best selling Sauvignon Blanc in the United States. The ranking is based upon sales volume, but the wines retail for about the same $10 to $12 price, so Nobilo probably ranks first by value as well. An amazing achievement, given the many obvious challenges the New Zealand wine industry faces in terms of size, production cost, shipping distances, access to US distribution and so on. It is interesting to consider how Nobilo and the New Zealand industry have managed to achieve this success. The first reason is the distinctive quality of Marlborough Sauvignon Blanc itself. Even wine critics who don’t think very highly of Sauvignon Blanc in general (I’m talking about you, Jancis Robinson) acknowledge that the Marlborough wines are distinctive and that the best of them are truly exceptional. In my house they set the standard for Sauvignon Blanc. Why are these wines so good (and so popular)? Winemakers always start with the vineyard and it is certainly true that Marlborough seems ideally suited to produce Sauvignon Blanc grapes. (Ironically, no grapes at all were grown there before the mid-1970s). The skills of the winemakers are also important. The distinctive style of the wines is another factor. The June 2009 Wine Business Monthly includes a fine article by Curtis Phillips on Sauvignon Blanc yeasts that nicely explains the NZ style. NZ SB, he writes, emphasizes a varietal style, letting the fruit speak forcefully. The French SB style is “anti-varietal,” he says, emphasizing texture and minerality over fruit aromas and flavors. Finally there is the oak-influenced style, which originated in France but was made famous by Mondavi as Fumé Blanc. This barrel-fermented SB style remains very popular in the U.S., but has obviously been eclipsed in the marketplace by the fruit-forward Marlborough product. The New Zealand varietal style is a hot commodity. New Zealand producers should hope that it stays hot and doesn’t fade as some popular regional styles have done (I’m thinking about how quickly Australian Shiraz has fallen from favor). Nobilo’s rise to #1 in the US market is not an accident, according to the Decanter.com article. Nobilo is a Constellation Brands product — one of five New Zealand export brands of ConstellationNZ (see logos above). Joe Stanton, the ConstellationNZ CEO, explains that his company’s strategy was to make Nobilo the top US SB by focusing on “traditional” wine buyers and giving them what they expect in the way of packaging for premium wine: cork instead of screw-cap, for example, and flint-colored glass bottles instead of traditional French green. Plus, of course, the intense Marlborough aromas and flavors. New wine in old bottles (and closures), I guess, and it worked. ConstellationNZ accounts for 40% of all NZ wine sold in the US — an astonishing figure, but understandable given the strong brands that it has acquired (Nobilo, Kim Crawford, Drylands, Selaks) or built (Monkey Bay)and the efficient distribution system that has evolved to get these wines and all the other Constellation products on store shelves and restaurant wine lists. In fact, the New Zealand industry is dominated by foreign-owned wineries, as wine writer Michael Cooper points out in the new edition of his fine Wine Atlas of New Zealand. Of the top wine producers only two (Delegat’s and Villa Maria) are Kiwi-owned. The largest producer is Pernod Ricard NZ (formerly Montana wines), part of the big French drinks group. Pernod manages 25 NZ brands according to their website, including of course Montana (sold as Brancott Estate in the US), Corbans, Church Road and others. The most famous NZ wine — Cloudy Bay — is owned by LVMH Möet Hennesy-Louis Vuitton, the French luxury goods conglomerate. Matua Valley, another leading NZ producer, is part of the Australian Foster’s Group. The list goes on. It is tempting to consider the pluses and minuses of international ownership as Michael Cooper does briefly in the article linked above. This is a topic that I plan to analyze in more detail my next book. In the meantime, however, it is perhaps best to consider how the combination of the local (New Zealand’s wonderful terroir) and the global (big multinationals like Constellation and Pernod Ricard) have combined to both produce New Zealand’s tasty wines and to deliver them to our doorsteps. New Zealand has done specutacularly well in the global wine market so far. What lies ahead? Watch this space!